A bunch of methi or fenugreek leaves. 2 tbsp. dry, kasoori methi can be used instead. Wash the spinach and fenugreek leaves well, remove any thick stalks. Chop and keep aside. Finely chop or coarsely grind onions ginger and garlic in a food processor. Heat the oil in a pan, add the onions*, ginger, garlic, and fry until onions are nicely browned. Add lamb and stir fry for 4-5 minutes on high, until meat is browned and sealed. Add the spices and salt and stir fry for a minute. Add tomatoes and green chillies, fry again until nicely mixed. Add a cup of water and bring to the boil. 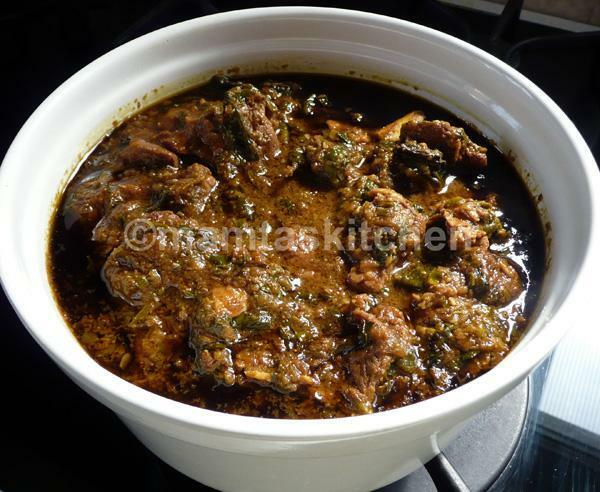 Cover and simmer for 25-30 minutes, until meat is tender, stirring from time to time. At this stage, meat can be left in a slow cooker to cook over a few hours. This gives a very tender lamb at the end. 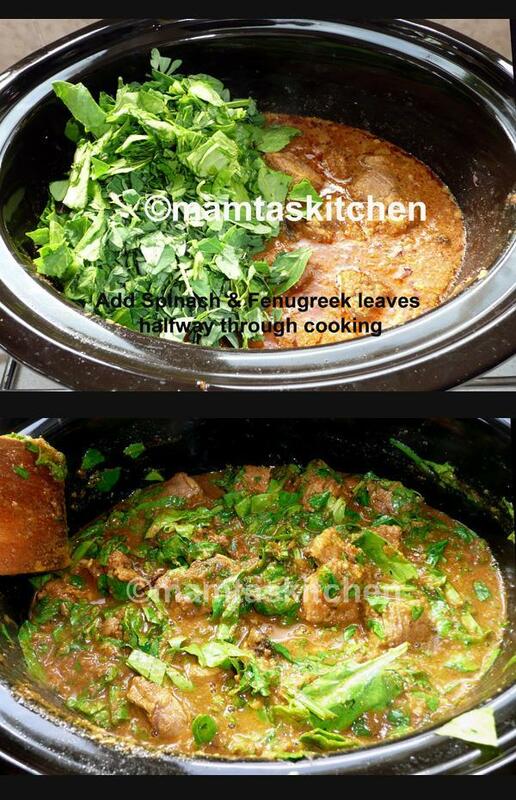 Add the spinach and fenugreek leaves to the lamb halfway through the cooking and cook over a medium heat until meat is tender, stirring a few times. Saag should be clinging around the meat pieces. Most of the liquid should be evaporated. Serve hot with Chapatti or Tandoori Roti 1 or Tandoori Roti 2 or Nan. Cooking in a Slow Cooker or Crock pot; Place everything except spinach and methi leaves in a bowl, mix, leave to marinate for a couple of hours. Cook as per instructions in your slow cooker book for meat casserole. I cook on high for 3-4 hours and then leave it on slow for a couple of hours. Add spinach and methi leaves, stir them in and cook for another hour or so. *For a restaurant like curry, fry sliced onions until quite brown. Then grind them. Then heat oil, fry ginger and garlic and add purd onions. Now proceed from step 5. Saag or sag, is a generic term and means any green, leafy vegetables like spinach, fenugreek leaves, mustard leaves and so on.